NBC University of The Air presented several educational programs between 1942 and 1948. The subject matter and themes ranged from politics and philosphy, to music appreciation and history. The programming from NBC Univerity of The Air was deemed so instructive that it was incorporated into the curricula of many high schools, colleges and universities throughout the U.S. and Canada during the period. 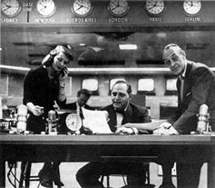 Indeed, Columbia University of New York collaborated extensively with NBC in developing several of NBC University of The Air productions throughout the era. 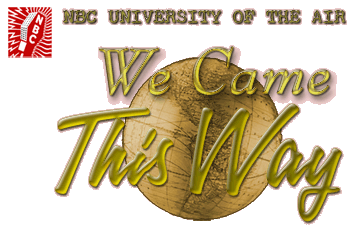 By far the most interesting and instructive of the NBC University of The Air canon was the We Came This Way series of docudramas tracing the development of the American culture, values, legal system, and ideals from the earliest framework for these aspects of modern society throughout modern civilization. The series was inaugurated, appropriately enough, with the history of the signing of the Magna Carta, one of modern civilization's most significant universal ideals of a modern legal system. The Magna Carta became the basis for most of the common law employed throughout the civilized world. Such legal concepts as the rights of the accused and the principle of habeas corpus or "you have the body." It established the rights of anyone held for an alleged crime or infraction to have every aspect of their detention or charges to be recorded and defined for any possible challenges to those actions. Other common laws reasserted by the Magna Carta were in regards to the conveyance of property or land, principles of fair trade and taxation, and provisions for establishing a bond of marriage between a man and woman. The series continued to trace these earliest principles of a democratic civilization throughout the many significant events and developments from the Middle Ages to the present, that continued to define, inform and shape modern American democracy. Indeed We Came This Way stands the test of time to this day. The genius of the thirty-four programs was their underlying arguments on both sides of every democratic ideal presented throughout the series. Those arguments remain as timeless today as they were seventy years ago. Run Dates(s)/ Time(s): 44-10-06 to 45-10-04; NBC [WMAQ, Chicago]; Thirty-four, 30-minute programs; Fridays, 11:30 p.m., then Thursdays, 10:30 p.m. and 11:30 p.m.
55-01-15 to 55-04-09; NBC [WMAQ, Chicago]; Thirteen, 30-minute programs; Saturdays at 1 p.m. Passing as they have through the reckless 'stewardship' of the OTR Community it should come as no surprise that half of the circulating exemplars of We Came This Way have been stereoized to give them the appearance of being better and higher quality .mp3 encodes than they actually are. In fact, both channels of all of those adulterated exemplars are actually carbon-copy monaural channels. We've naturally corrected that adulteration in our own twenty-nine exemplars. We Came This Way: Play, "Magna Charta"-WEAF, 11:30-12. We Came This Way: "Wat Tyler's Rebellion"-WEAF, 11:30-12. We Came This Way: Play, "The Story of Andreas," With Dana Andrews, Skippy Homeier, Others-WEAF. 11:30-12. We Came This Way: Play, "Joan of Arc"-WEAF, 11:30-12. 10:30 p.m.--We Came This Way (WIBA): drama on ideals of freedom in German life of 16th century. 10:30 p.m.--We Came This Way (WIBA): drama on liberation of Holland. We Came This Way: "The Puritan Revolution"-WEAF, 11:30-12. We Came This Way: "Founding of Rhode Island"-WEAF, 11:30-12. We Came This Way: Play, "Voltaire"-WEAF, 11:30-12. We Came This Way: "Valley Forge"-WEAF, 11:30-12. We Came This Way: "Marquis de Lafayette"-WEAF, 11:30-12. We Came This Way: "The French Revolution"-WEAF, 11:30-12. We Came This Way: "Thaddeus Kosciuszko"--WEAF, 11:30-12. We Came This Way: "John Bright"--WEAF, 11:30-12. We Came This Way: 'The First Underground"--WEAF, 11:30-12. We Came This Way: "The Common Man Becomes A Citizen"-WEAF, 11:30-12. We Came This Way: "Joseph Mazzini"--WEAF, 11:30-12. We Came This Way: "A Boy Named Carl"--WEAF, 11:30-12. The World's Great Novels: "Jane Eyre"-WEAF, 11:30-12. 10:30-11 We Came This Way: Drama, "Lincoln, Freedom and Justice"--WEAF. 10:30-11 We Came This Way: "Alexander Petofi"--WEAF. 10:30-11 We Came This Way: Drama: "Victor Hugo"-WEAF. 10:30-11 We Came This Way: Drama, "Walt Whitman"-WEAF. 11:30-12 We Came This Way: Drama, "Fight Against Tyranny"-WEAF. 10:30-11 We Came This Way: "Kossuth, the Struggle for Existence"-WEAF. 11:30-12 Drama: "We Came This Way"--WEAF. 10:30 p.m.--We Came This Way (WMAQ): "Tolstoi: Pacifist Revolutionary." 11:30-12 Drama: "Story of Leon Bambetta" WEAF. 11:30-12--We Came This Way: Drama, "Story of Emile Zola"--WEAF. 11:30-12--We Came This Way: Play, "Kropotkin, Prince in Revolt"--WEAF. 11:30-12--We Came This Way: Play, "Masaryk, Father of His Country"--WEAF. 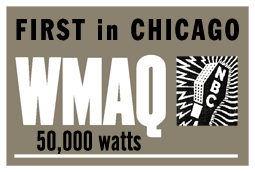 11:30 p.m.--We Came This Way (WMAQ): "Wilson--Builder of Peace." 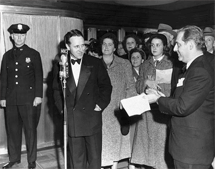 11:30-WEAF--Drama: We Came This Way, "Song for Franklin D. Roosevelt"
Birthplace: Staten Island, New York City, U.S.A.
Ben Grauer applauds the Boss, Raymond Firestone on accepting an award for The Firestone Hour. Ben Grauer sits at the Monitor Desk with Miss Monitor on the phone. Benjamin Franklin Grauer was born in Staten Island, New York. Already a child actor in films and on Broadway during the 1920s, he began his career as a child actor in David Warfield's production of The Return of Peter Grimm. Among his early credits were roles in films directed by D.W. Griffith. After graduating from Townsend Harris High School, he received his B.A. from City College of New York in 1930. 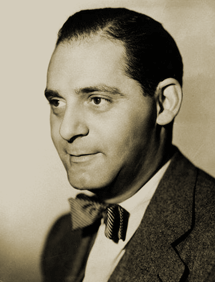 Grauer started in radio as an actor but soon joined the broadcasting staff of the National Broadcasting Company. Grauer was one of the four narrators, along with Burgess Meredith, of NBC's public affairs series The Big Story, which focused on courageous journalists. Starting in 1932, Grauer covered the Olympic Games, presidential inaugurations and international events. During the course of his extraordinary radio career, Ben Grauer covered nearly every major historic event, including the Morro Castle fire, the Paris Peace Conference and the US Occupation of Japan. 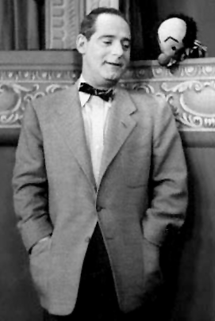 Upon graduating in 1930, a 22-year-old Ben Grauer joined the staff at NBC. He quickly rose through the ranks to become a senior commentator and reporter. 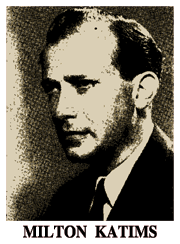 He was the designated announcer for the popular 1940s Walter Winchell's Jergens Journal and was selected by Arturo Toscanini to become the voice of the NBC Symphony Orchestra. Grauer took over in 1940 and remained until it was disbanded in June 1954. Toscanini said he was his favorite announcer. 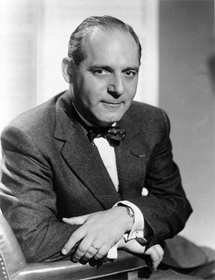 Grauer provided the commentary for NBC's first television special--the opening in of the 1939 New York World's Fair. In 1948 Grauer, together with John Cameron Swayze provided the first live TV coverage of the national political conventions. In 1956 NBC began broadcasting some of their shows in living color and in 1957 the animated Peacock logo made its debut. It was Grauer who first spoke the now famous words, "The following program is brought to you in living color on NBC," behind the Peacock graphic. 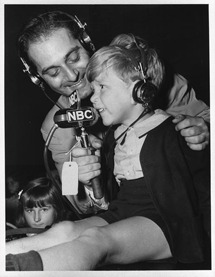 During his forty year broadcast career, Ben Grauer hosted numerous TV programs on NBC, including game shows, quiz shows, concerts and news programs. 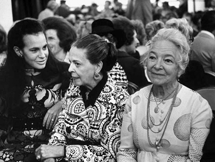 In 1954, he married interior designer Melanie Kahane. Millions still remember his NBC coverage of the annual New Year's celebrations on both radio and TV. Between 1951 and 1969, Grauer covered New Years Eve at Times' Square eleven times. Grauer continued covering New Year's Eve for Guy Lombardo's New Year's Eve specials on CBS throughout the 1970s, with his last appearance on December 31, 1976, the year before both he and Guy Lombardo died. Several years after the death of Toscanini, Grauer and composer Don Gillis (who produced the NBC programs from 1947 to 1954), created the Peabody Award-winning radio series Toscanini, the Man Behind the Legend. Beginning in 1963, it continued through the centennial of Toscanini's birth in 1967. The Toscanini series ran for nearly two decades on NBC Radio and then other radio stations until the early 1980s. In the last decade before his death, Grauer collected material for a projected history of Prices and Pricing, with special attention to Book Prices. 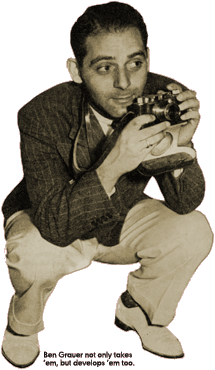 He was active in several professional journalistic organizations as well as the Grolier Club. Grauer had a strong interest in the graphic arts, annually printing his own Christmas cards. All of the networks produced at least one or two truly memorable network voices, whether as recurring announcers, heavily tapped narrators, or on occasion simply the voice of a familiar newsreader. NBC Radio was particularly blessed in this regard, as were its listeners. CBS had Dan Seymour, and NBC had Ben Grauer. The two were justifiable legends in their own lights at their respective networks. But Ben Grauer quite literally did it all at NBC. No matter the task--from newswriting or reading to comedy to Toscanini to quiz shows to all day stints at Monitor--and on both Radio and Television. Ben Grauer literally has no equal in the history of Radio and Television as an announcer, and few equals in overall versatility. The literally thousands of circulating Radio recordings and Television kinescopes or films that bear Ben Grauer's unmistakable signature--crystal clear ennunciation, steady rock-solid delivery, and natural enthusiasm. We miss him now 32 years after his passing and indeed he will always be missed as long as any of his recordings remain available.